Ever Needed a Reason to Kick Drugs? Evil Dead is probably the most extreme anti drugs campaign that I have ever seen. The film follows a group of young’uns as they spend a few nights in a cabin in the woods in an attempt to help one of them get through going cold turkey from…. well…. I’m not sure so I’m going to go with…… ‘DRUGS’. Naturally they find an evil book of witch craft in the basement and of course read from it, because why not, releasing the forces of hell upon the cabin. A whole load of disgusting and gory scenes follow ending in *and don’t read further if you don’t want to spoil it* the drug addict surviving and all her friends and her brother being brutally murdered. So what did we learn? Drugs are bad. Being a drug abuser will result in the gruesome slaughter of your friends and family. It will result in being possessed via the privates by a tree and end in a fight to the death with hells most dangerous creatures. Anyway once you get past the underlying message of the film, the film itself is pretty much everything you’d expect. It’s another remake that did not need to exist. It would have been easy to make a very similar film without calling it an Evil Dead remake, simply attaching that iconic title for me is a way of guaranteeing an audience and nothing more. It definitely does not stand up to the cult qualities of the original. However, it is a decent horror, in a sense that it’s creepy, disgusting and ‘jumpy’. It’s pure entertainment which is worth watching for horror fans but most probably a film that you will forget the minute it’s finished. The film does use a lot of similar effects to the original in a sense that it has zero CGI use (or at least minimal) which is interesting to see when looking at how far special effects have came since the 80s. That is a desperate attempt to find something interesting about the film I know but it really is as obvious and simple as you no doubt expect it to be. If you are a big horror fan or if you really are struggling for a reason to chuck drugs then you might as well give this film a shot, otherwise, just avoid it. tagged as Evil Dead, Fede Alvarez, film, horror, movie., Remake, review, The Evil Dead. 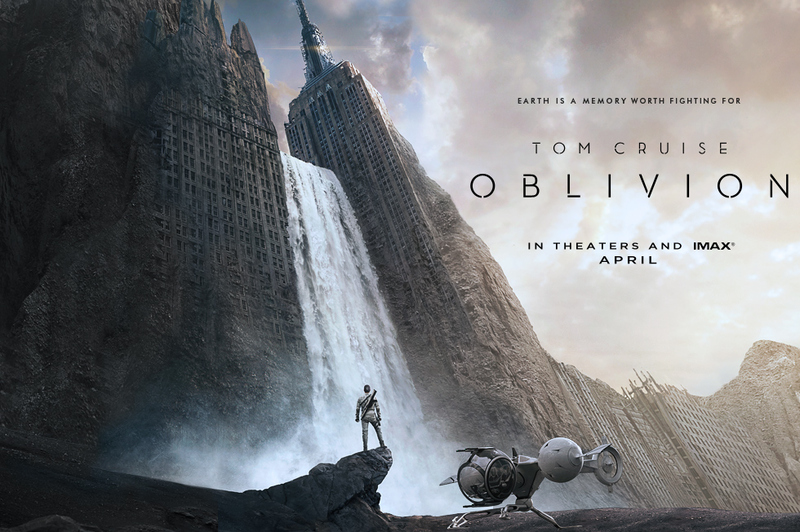 Joseph Kosinski’s Oblivion is a beautiful film. The films view on nature is inspiring. The landscapes depicted, as desolate as they may seem, only highlight the power, scale and beauty of the earth. The last Sci-Fi that I saw of this magnitude was Prometheus and although that also looked fantastic it failed to deliver in terms of narrative. So the question is, how does Oblivion? The film has a number of twists and turns, a few of which are apparent in the trailer(!). I would say all of the twists bar perhaps one, are rather predictable. However this still doesn’t prevent my enjoyment of the film. The jist is this. Jack (Tom Cruise) and Victoria (Andrea Riseborough) live on a destroyed earth, after a war with an unknown species called ‘Scavs’ leaves the planet and moon in ruins the remaining population of earth has moved to Titan, one of Saturn’s moons. Jack and Julia are assigned as the mop up squad on earth, maintaining robots that work to protect a large structure that absorbs energy from the ocean in order to provide that energy for the colonies of Titan. Jack begins to question his position in the role he has undertaken and shortly discovers that all is not as it seems. The overall story arc of the film seems to have been done time and time again however there are smaller plot elements that make this story much more interesting. Its intertwining of twists often overlap each other making, at times, more questions arise. I read in an article that said it seems Kosinski presumes that the audience know as much about the narrative as he does making the story hard to follow and difficult to understand. I think this is rubbish. The film doesn’t spoon feed its audience and never directly tells the audience what they are supposed to understand through the visuals but for me this is great. It often makes you question your theories of what seems like a straight forward narrative. This is what I enjoyed about the film, although the narrative was predictable, Kosinski has thrown curve balls at the audience to deter them from what they think is happening. The film most certainly looks amazing. It’s as though every shot is a money shot and is a prime example of how the often over used method of CGI can create superb and exhilarating settings for a film. There was never a moment when I questioned the landscape of the film, which in a Sci-Fi is integral. The costume and set design were both astounding although Jacks gun did remind me of the old SNES Super Scope and the soundtrack was emotional and exciting. Oblivion is not a perfect film and I don’t think it will be for everyone, but it’s a great Sunday night watch, in a dark room with those speakers turned right up. 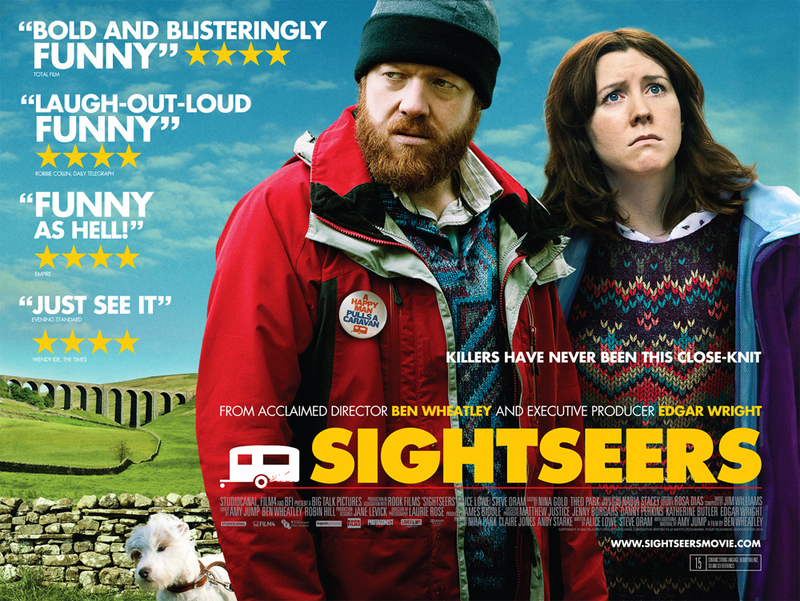 Sightseers is a dark comedy and is the third feature from British director Ben Wheatley and it’s been a while since I’ve seen a film quite like it. The story follows two characters, Tina (Alice Lowe) and Chris (Steve Oram) as they embark on a tour of rural Britain discovering everything that the countryside has to offer. The trip soon turns sour after a tourist drops his Cornetto wrapper on the floor. This sparks a homicidal rampage from both Chris and Tina. They begin by reversing their caravan over the Cornetto man and from there they escalate their brutal yet hilarious string of murders. The story feels like a series of episodes where you find yourself wondering who they will kill in this situation and how will they do it. The link between the killings is that Chris, who is a struggling to write, finds his muse in Tina who then decides that murder is Chris’s way of drawing inspiration. So she encourages Chris to kill. Tina also kills in a desperate attempt to get Chris to like her. This concept accompanied by the hilarious dialogue and ridiculous setting takes you on a journey that will have you laughing for days. The killings for Tina and Chris aren’t necessarily a big deal, more of an annoyance against the enjoyment of their holiday. Chris says after running down the Cornetto man that he (the Cornetto man) has “ruined” the tram museum for him. It’s this kind of character interaction that brings such hilarity to the film. It reminds me of the work or Martin McDonagh on In Bruges or Seven Psychopaths. Although Tina and Chris are both murderers and generally very strange individuals you find yourself truly enjoying their company in the 88 minutes you spend with them. This film has put Ben Wheatley on the map for me after I was beyond confused with his previous film Kill List. He is without a doubt a unique film maker, one of which we all need to look out for. Another thing I really like about him is that he is a British director making British films. tagged as Alice Lowe, Britain, British Film, Comedy, Dark Comedy., film, Holiday, In Bruges, Martin McDonagh, movie., review, Seven Psychopaths, Sightseers. Ben Wheatley, Steve Oram. It’s been a couple of days now since I saw Trance (Dir. D. Boyle), and it’s grown on me. At first, the films glossy, abrupt and impersonal textures lead to a feeling of being unattached to the story. However, the complex plot, with its many twists and turns, lead the film through its plastic, TV-movie-esque facade and deliver it into a clever and believable (but not totally surprising) twist ending. The plot reflects the style in which Trance has been filmed; it is unbelievable and at some point, ridiculous. The narration direct to camera at the start of the film from Simon, gives a feeling that we are about to watch a feature episode of the BBC’s Hustle. Together with the fact that a group of hardened criminals would allow a psychiatrist (Elizabeth, played by Rosario Dawson) to take up partnership with them is absurd. These two elements make the film feel childish from the start; they appear as a naive attempt to move the plot forward for the purpose of the twist at the end. But if you allow yourself to go along with the illogical plot, you will be rewarded with a fast-paced and treacherous journey leading to an explosive ending. If you want to watch a similar take on ‘reality vs illusion’ style film, check out Eternal Sunshine of the Spotless Mind (Dir. M. Gondry) and of course the fantastic Inception (Dir. C. Nolan). Side Effects (Dir. S. Soderbergh), unfortunately, feels like nothing more than that – an annoying, added portion of something you think may be good. If you have watched Michael Clayton or The Constant Gardener, then you will be extremely let down by Side Effects, which struggles to live up to the aforementioned films level of ingenuity. The substantially basic narrative is barely aided by a solid performance from Jude Law, playing the films protagonist, whilst the rest of the cast seem to be taking a medication that induces ‘wooden performances’. The films lead lady, Emily Taylor (played by Rooney Mara), is nothing more than a two dimensional role, even though the character (as do many other characters in the movie) has so much more room for manoeuvre but is let down by a poor narrative. Side Effects gives the audience no emotional connection whatsoever to any character in the film. Let’s use The Constant Gardener as an example. With a similar plot, The Constant Gardener delivers a level of emotion because the films hero, Ralph Fiennes, is fighting to reveal a pharmaceutical companies exploitation of millions of Africans, and trying to stop drug testing that is killing them; he is fighting a good cause, and he is a likeable character. 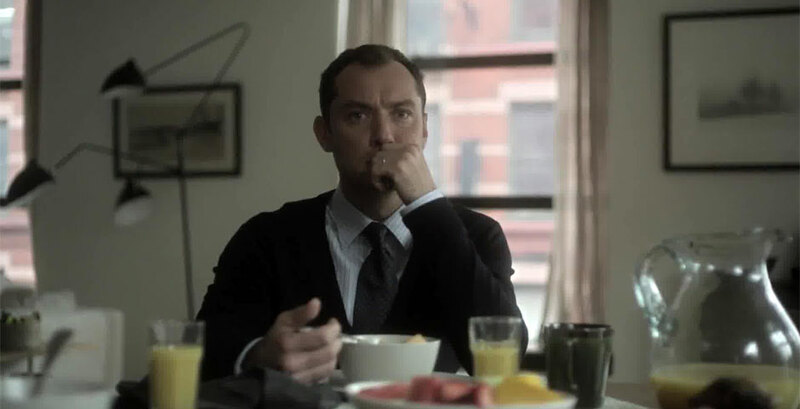 In Side Effects, Dr. Banks (Jude Law) is struggling to prove that Taylor did indeed consciously kill her own husband, and has framed it all on the drugs she was taking. As the film whirlwinds through his very brief, home made investigation, we are given tiny spits of scenes where the film strains to give some emotionality to the characters, but, instead, just leaves you frustrated. It doesn’t focus on how Banks has hit rock bottom in his life, losing everything, but instead, show you what the audience has already worked out half an hour before, that she murdered her husband for money. Banks is a likeable character, but there is nothing more to him than that, he is just ‘Okay’. What was needed was for more time to be spent focusing on him, instead of on Taylor (which is what the first half of the film does). If the film had added an element of emotion into the story line, there might have been some connection, which could have lead to this film getting near a level of smart. But, unfortunately, it has wasted what could have been an interesting plot and leaves you with nearly two hours lost forever and £3.80 shy. As television programs continue to rival the quality of the cinema its hard to decide on what to dedicate your precious time too. After all you’ll have to set aside a good 10/12 hours to get through a season. I don’t care if he was in High School Musical I like Zac Efron and I think this looks quite good!